Teresa Barnhouse displays one of the gift bags prepared by Patriot Guard members for shut-in veterans at St. Mary. 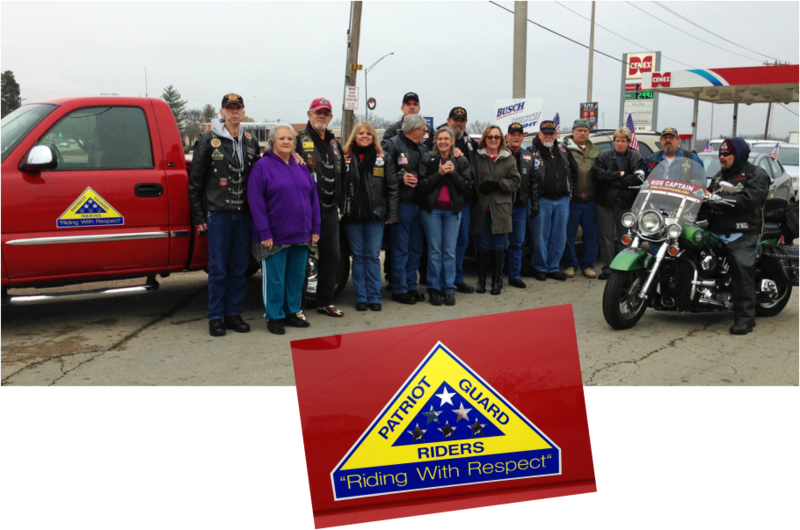 December 19 – Members of the Lead Belt Patriot Guard gathered early this morning at the Eagle Stop Cenex center here where they prepared for a trip to the St. Mary Nursing Home (Marian Cliff Manor) to deliver large bags of comfort gifts to each of the 70 veterans who live there. The gift items, collected from many sources by the Patriot Guard, include sock caps, gloves, four pair of socks, bags of shaving and dental items, bathing supplies, lap throws for keeping warm while in wheel chairs, plus bags of oranges, apples, and a box of cherry-filled chocolate.